Size: 442 sq. m. "or 4757 sq ft. floor area"
Lot Size: 375sq. 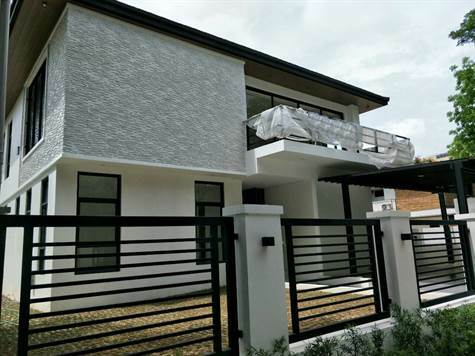 m. n/a "or 4036 sq ft lot area"
Newly built three bedroom house with a den/guest room in a quiet neighborhooda stone throw away from Alabang Town Center and not far from San Beda College. Bright, spacious and functional layout. Master's bedroom is 32 sqm, with balcony and wood flooring. Master's bathroom: his and hers walk-in closet, toilet, shower, atrium, bathtub, his and hers lavatories. Bedrooms are 19 to 20 sqm. Wood flooring, Individual toilet and bath. All bathrooms firxtures is Hans Grohe. Tierra Nueva Village is a small exclusive village located almost along Alabang-Zapote Road and right across Madrigal Business Park and adjacent to Alabang Hills and San Beda College. It is not far from Alabang Town Center and Festival Mall. Lot sizes aree from 300 sqm to 500 sqm.